We are the Champions ... AGAIN! Last week was Fiesta week in San Antonio. On Monday Scott's parents came over to meet us and my parents for the river parade on the San Antonio river walk. It was so nice to have both sets of grandparents to ourselves. In case you can't see it on their faces, our kids love spending time with all of them! On Tuesday my sister came down from Dallas and met us at the IMAX theater. 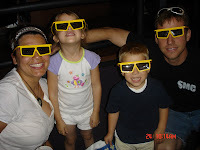 We watched a 3d Deep Sea show. Rana and Owen both tried to reach out and touch the various marine life. Watching them was a highlight. They're such cool kids. We spent Tuesday night with more of my people (that's for you, Liz! 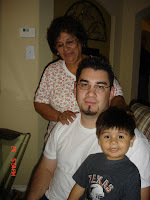 ), my Aunti Vera, Uncle Victor, cousin Leo and his son Dillon, and cousin Blanca (due any day!) and her husband Al. I don't get to see them often enough. It was a fun evening . Wednesday was a GREAT day. My mom and Walter gave Scott and I their Maverick playoff tickets. So, we drove 5 hours to Dallas, saw the game, and drove 5 hours back. Sound crazy? We thought so too, until we considered that we had a full 24 hours to ourselves (they wanted to watch the kids while we went!). On the way there and back I cranked the radio up and sang with all my favorite artists (Prince and Miss Jackson to name a couple) at the top of my lungs, and Scott read. We went to the game (the Mavs WON! ), then checked into a hotel and SLEPT IN! Loved it ... a lot! Thursday night we took the river tour on one of the river boats, then took the kids to the Fiesta carnival with my parents. All of it was great. There is so much history and culture on and around the river. I was proud to expose my kids to all of it. On Friday we unofficially ended our vacation with a visit to Sea World. The kids LOVED it. 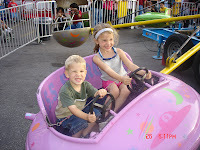 The shows were great as were the rides and other attractions. It was well worth the time and money. And, now we're back. 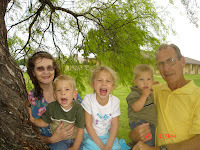 San Antonio was great -- the vacation, the time with our family and extended family, and even the weather was incredible. Hopefully we won't have to wait another 3 years to vacation again! I was trying to forget about the tornado. Didn't have a pic of it! Yea, how fun...see now you don't need to scrapbook, got it all right here! Sounds like a great time! I love San Antonio, in fact Taylor has been asking to go back to Sea World this summer. 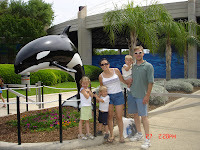 Great pictures, nice family pic at Sea World, I'm wondering how you managed to have 3 kids and not have cellulite? Did you airbrush your legs in that picture? 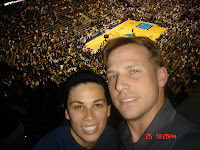 =) How awesome that you and Scott got to go to a Mavs playoff game!! Were you in Dallas long enough to miss it and want to move back?? Well I'm glad ya'll had a great vacation!! 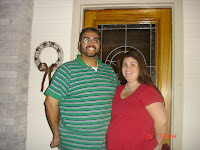 Didn't have time to read this whole blog, but did have time to blow up that family pic and see how freakin good you look! Holy Cow Velvet you look even thinner than college days. Is it the Volley ball, or what , please tell me so I can do it. You guys are killin' me. I hate my legs in that pic, and I am definitely not thinner than I was in college. But, thanks for the compliments. You guys are obviously true, lifetime friends! By the way, you are looking VERY good- so you can forget all that modesty! It's true & I don't lie. Now I'm going to have to confess my jealousy again! Dang! 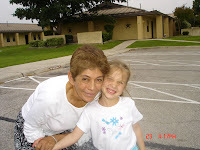 See, I always hold a kid in front of me when I get pictures taken. But you don't have to. I guess that makes you "one of those people I don't like". I'm jealous too! We don't leave for vacation until the end of June and it's just not coming fast enough! I need to get out of dodge! Sounds like you guys had a fun time. 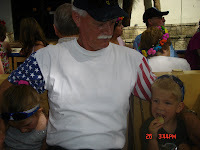 I also love to see Jack having fun, that makes the expense all worth it!